In this Part 1 video, Amanda Martinage provides an overview of tactile processing. She talks about what tactile processing is, the functions of the tactile system and what tactile dysfunction looks like. Amanda also dicusses the different kinds of difficulties in the tactile area: tactile hypersensitivity and tactile hyposensitivity. MARTINAGE: Hi, my name is Amanda Martinage. I am an occupational therapist, and I work at CASE collaborative. And today for your teachable moment, we will be talking about tactile processing. This is going to be one of two teachable moments. This first one will focus on what tactile processing is and what dysfunction looks like. So let's grab that first question and roll with it. What is tactile processing? Is how our bodies interpret information from our sense of touch. This includes light touch, deep pressure, vibration, and temperature. So the functions of our tactile system include, there are two functions. The first is to keep us safe. So if you think about when you are approaching a hot surface, like an oven or a burner, when you start to reach out to touch it, you feel the warmth. And feeling that warmth makes you withdraw your hand, because you do not want to get burnt. That's an example of how that sense of tactile, or tactile system, keeps us safe. The second function is that it allows us to bond with others and to develop socially and emotionally. If you have difficulties accepting tactile input — maybe you don't like hugs, or oftentimes somebody will give you an encouraging pat on the back — if that's something that bothers you and you react aversely, you're going to have a harder time socially in social situations. And then accepting a hug from your parent is going to be difficult. It impacts your ability to bond emotionally with a parent or family members. I have some examples of tactile experiences, some of which are photos, some that I have brought here today. 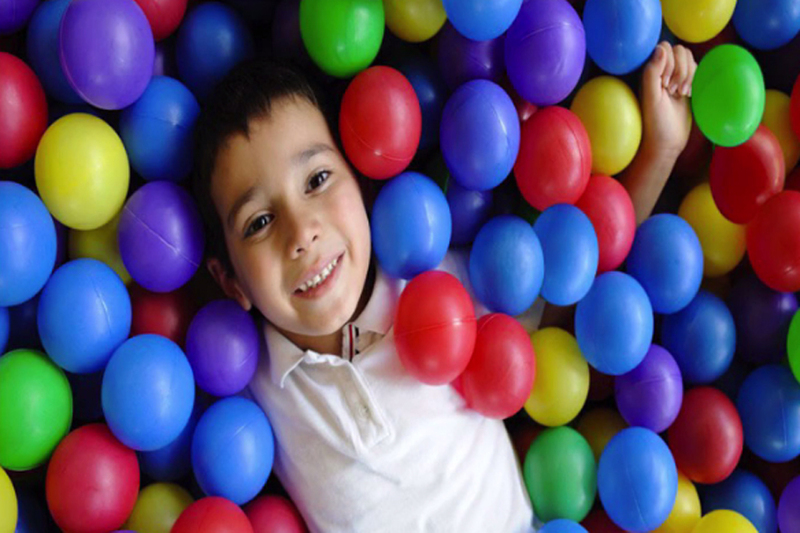 The first picture is of a little boy in a ball pit. He's just getting bombarded with all sorts of tactile information to his entire body. Our second picture is of a little boy in a big beanbag chair, and he's holding onto a stuffed animal. Not only is he getting tactile information from that beanbag chair that's just enveloping him, he's also holding onto that stuffed animal. We have a picture of a couple children playing on some sensory floor tiles, and those tiles just have a bunch of different textures. And they're crawling around getting input into their hands, onto their knees, and potentially onto their feet. This picture is a bunch of fidget toys. A lot of times that's what people will think of when they think of tactile experiences, are those fidget toys. I actually have some examples of fidget toys here today. And they take all sorts of size and shape. Some fidget toys can be kind of squirmy, and they have different tentacles on them, while others are maybe more spiky. You can have some that are soft in nature. So really the fidget toys are kind of dependent upon the person who uses them, because some people may find that this is very appealing, while other people may find it to be very aversive. So when you're using fidget toys you have to figure out which ones people like. Another picture is a little boy swimming in the pool. And you're in the pool, again, you're just getting all this tactile information to your entire body. Last picture is of a little girl chewing on a chew toy. And what we want to think about when we think about tactile is it's not just the information that we're getting from our skin and from our hands and our feet, but it's also including our mouths. So when this little girl's chewing on a chewy tube to get all sorts of information into her mouth. Some of the other experiences that I brought — vibration is also included into your tactile systems, so this is just a fun little vibration toy. And you turn it on, and you can get all sorts of massage through your body parts. They have all sorts of fun massagers for children now. And this other toy is just one that's kind of fun, that you press a hand or a foot against it, and you can not only see the outline and it's fun to look at, but it also feels really interesting on your hands. So let's talk about what tactile dysfunction looks like. Oftentimes children with tactile dysfunction have difficulties with socialization. And that's because they're often overly self-protective of somebody bumping them or coming into their space. And so interacting with other people and being in social situations, especially those that involve a lot of people and unexpected bumps, are particularly difficult. Talk about the different kinds of difficulties in the tactile area. There is tactile hypersensitivity and hyposensitivity. 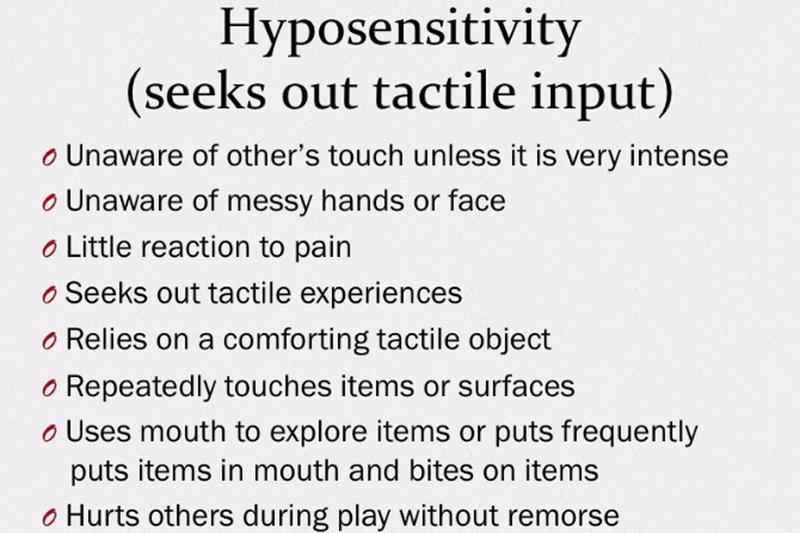 Hypersensitivity is an overly sensitive sensitivity to tactile input. So these children are going to feel a more exaggerated version of what the typical individual feels. It's just a more intense experience of tactile input. The opposite of that is tactile hyposensitivity. These children need more input to feel what the typical individual feels. Let's break that down and actually apply it to some everyday situations. What does hypersensitivity, an overly sensitive touch, what does that look like? Examples are, they're sensitive to other people's touch, especially light touch. So any sort of, like, brushing up against somebody is going to be more aversive than if you use, like, a firm kind of grasp on them. Children also demonstrate discomfort with certain clothing materials. So they're overly aware of the tags in their clothing or the seams on their socks. Oftentimes they are avoiding touching messy substances. They will often avoid walking barefoot on unfamiliar surfaces, so that might mean grass outside, it might be when there's a change of carpet from hardwood. Sometimes there's difficulty with various food textures. So they may be fine eating, like, a pureed kind of food, but then when you start to integrate any sort of mixing in with that puree, they start to have some difficulty. Sometimes you'll notice that these children will arm themselves with a weapon. And when I talk about a weapon, I mean more like if they're out on the playground they're carrying a stick with them. So in case somebody comes in their space, they're going to have that stick to kind of keep people away. Really being protective of the space and who's within their space. Hyposensitivity, when you're seeking out tactile input, is going to look pretty much the opposite of that. They're going to be unaware of other people's touch unless it's very intense. Oftentimes they're walking around with their hands and their face really messy, because they just don't feel anything on them. They usually display little reaction to pain. So they fall and what a normal, a typical individual would have a hard time with, they don't even really seem to notice. Children are seeking out tactile experiences, so if they were sitting in this room with us and I was trying to teach something, all of these materials would just be in their hands. They would not be able to focus on anything, because they just want to touch all of this. Children oftentimes rely on comforting tactile objects, so maybe having one thing with them while they're sitting to do some learning, that's going to be helpful for them. Oftentimes these children are repeatedly touching items or surfaces. We'll notice when a child is rolling around on the carpet, that might be an indication where there's plenty of places to sit, but instead they choose to roll on the carpet. Or they're using their hands to kind of rub on all sorts of items. Children use their mouth to explore items or frequently put items into their mouth beyond the age where it's age appropriate. So maybe they're chewing on the end of their pencil or pen or marker or just putting lots of materials into their mouth. And one of the last things is sometimes these children are playing with other children and then hurting them, and they don't really seem to have remorse. And the reason for that is they're not really understanding if they aren't understanding what pain feels like, what tactile information feels like to the typical person, they're not going to be able to understand that in somebody else. So that is our teachable moment on tactile dysfunction, what tactile processing is and the dysfunction. Thanks for watching. I hope you found it helpful. I'm Amanda Martinage, and that's today's teachable moment. For more information and other teachable moments, visit perkinselearning.org.